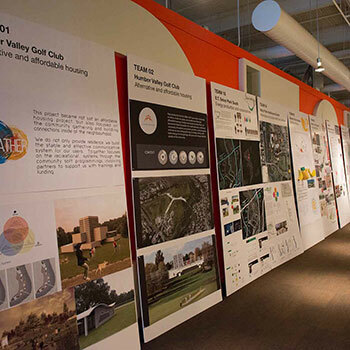 The Toronto Charrette is an annual IwB event that brings together 200 plus students, faculty and industry experts from organizations around the world. In 2015, the charrette theme was Toronto’s urban ravines, specifically how to stimulate new social infrastructure in the city’s ravine systems. The charrette was called “Our City within a Park.” It focused on 6 themes with which to transform the way we make use of the extensive river and ravine networks in Toronto: alternative and affordable housing, alternative and public health and wellness, food and lifestyle, active transportation, energy production and consumption and youth programs and access to postsecondary education. Two teams were assigned to each theme and a specific site in Toronto, together making 12 teams. The event took place from Thursday, February 19th to Monday, February 23rd. Based on assigned case study sites and themes, charrette teams were asked to rethink the use of Toronto’s ravines and propose new ways to activate them for the city’s inhabitants. How can we design new social infrastructure to connect the City of Toronto through its urban ravine system? From the Humber River to the Don Valley and over to the Rouge River “Toronto is a city of ravines” (Toronto and Region Conservation Authority). A large portion of the City’s population closely surrounds the ravines and their associated green spaces, trails and park systems. Toronto’s ravine system is a collective natural backyard and a key part of the public realm. Constituting upwards of 5% of the city’s area, the intersecting ravines form a system of linear corridors touching neighbourhoods from Etobicoke to Scarborough and everywhere in between. Ravines are critical to our natural ecosystem and they sustain our urban health by improving air quality, controlling flood waters and reducing heat island effect. Containing over 10,500 acres of recreational space for walking, hiking, kayaking, cycling, mountain biking and exploring, the network provides a refuge from the stresses of urban life. The Toronto region recently reached 6 million residents, which will significantly increase the demands on our ravines, parks and trail systems to serve not only as a place for recreation, but also to provide new services and social infrastructure. The intent of the City within a Park Charrette was to explore issues that are affecting Toronto through the lens of the Toronto Foundation’s Vital Signs®, and to propose ways that Toronto’s ravine system can influence the public realm and enhance the city’s social infrastructure. This charrette examined different ways the ravine network can strengthen the City of Toronto. Teams 1 and 2 were given the task of exploring the potential for the city’s ravines to connect with and contribute to a new model for affordable housing. The teams were asked to consider how we can establish longterm affordable housing that explores alternative funding models, creates unique ownership models and social services that support opportunities for all community residents? Team 1 proposed building a platform for an active community called TO.GATHER. The platform would be made up of resources that encourage community members to connect and cross paths. For more info about this project, see the project presentation here. Team two proposed a structure that physically and socially bridges over the Humber River. The structure is a foundation for repurposing the Humber Valley Golf Course into a residential and multi-use space. Teams 3 and 4 were given the task of exploring the potential for city ravines to create alternative spaces and programs for health and wellness. The teams were asked to consider how we can create better, more targeted health programs and infrastructure for local and regional residents? Team 4 created Wishlist, an innovative solution to save the schools that are on the ‘cut-list’ and are in danger of being demolished or be sold to private developers. WISHLIST reimagines schools as a catalyst to create better and more targeted health programs as well as social infrastructure for local and regional residents. Teams 5 and 6 were given the task of exploring the potential for city ravines to positively impact our food system and create new ways for how food is delivered. The teams were asked to consider how we can utilize the ravines to rethink food in the urban context? Team 5 looked at how the Toronto food terminal connects to the Mouth of the Humber River. 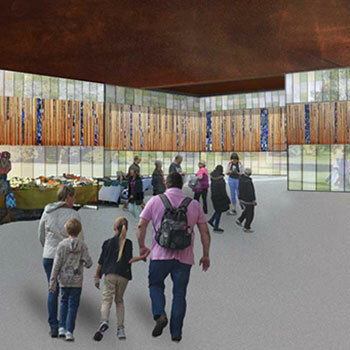 The Seed redesigns and rebrands the food terminal to create a physical and social food hub and a state of the art experiential learning facility. Team 6 proposed the Urban Table, a redevelopment plan for the Toronto food terminal and the area surrounding the Mouth of the Humber River as a way to redefine urban food culture. Teams 7 and 8 were given the task of exploring the potential for city ravines to become a catalyst for active transportation in Toronto through the creation of new infrastructure and programs. The teams were asked to consider how we can create and promote a car-free community in Toronto? Team 7 looked at the 14 hectare Unilever industrial site as an opportunity for redevelopment and a connection point between the Corktown and Leslieville communities. The proposal looked at activating the Lower Don Recreational Trail and creating new residential areas around the site. Team 8 proposed a car-free eco-village that reconnects the local ravine, environment and divided communities through social activities, movement, new infrastructure, programs, services and incentives. Teams 9 and 10 were given the task of exploring the potential for city ravines to be used in creating alternatives for energy production and its distribution, connecting to surrounding institutions and residents. The teams were asked to consider how we can develop a new energy system that serves adjacent communities and provides the Science Centre with a tool for education and demonstration? Team 9 focused on empowering youth by contributing to the cultural and social development of youth in communities surrounding E.T. Seaton Park South. The Roots is a space for creativity, innovation, learning and collaboration. Team 10 aimed to create an accessible ravine in the E.T. Seton Park area. 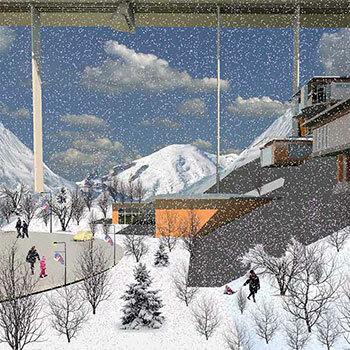 The team’s vision emphasized that the ravine brings energy to connect the community, as the community provides energy to the ravine. Therefore the focus of the team was to inspire the community to create a positive energy flow to the ravine. Teams 11 and 12 were given the task of exploring the potential for city ravines to become spaces where youth are engaged in new activities and programming through partnerships with postsecondary institutions. The teams were asked: how can we leverage the natural and physical resources of the University of Toronto Scarborough campus to create programs that connect and engage youth and the community with the post secondary system? Team 11 proposed a concept that produces increased social interaction as well as engaged learning and education for both the neighbourhood community and U of T at Scarborough Campus. Highland Creek enhances the arts and music provisions in the area and focuses on forging synergy between separated aspects of community through integrated and adaptable learning spaces. Team 12 proposed Union, a hub for youth and families to engage with community services and programs with a focus on mentorship, environmental stewardship, recreational activity and learning. UNION seeks to activate the Highland Creek ravine situated on the University of Toronto’s Scarborough Campus.